I claimed my first ITU World Cup win with an electrifying sprint in Mooloolaba, just pipping reigning champion Brad Kahlefeldt and another Frenchman, David Hauss, on the line in the first major event of the 2012 season. ( March, 2012). Winner in Geelong (AUS) for the ITU Continental Cup. After shadowing with Will Clarke (GBR) on the last lap, I managed to kick away with the finish line in sight. ( March, 2012). After 2009, I won my 2nd national title. I am really pleased with my victory, it will give me the joy to lead into the Olympics as the French Champion! (September,2011). I answered the London call and secured my spot for the next Olympic Game by finishing 6th and 1st French in the Olympic Test event(August,2011). Just a quick update to give some news after today. I received quite a lot of message on the last 6 hours. 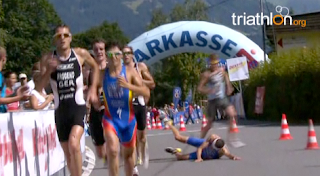 You might have seen me collapsing during the run in Kitzbuhel. I went to Austria with a big motivation and a strong determination to get a great result to end up the bad luck of this 2010 season. Well, my plan was going great until for undeterminated reasons I collapsed during the run. I have lost memory of what happened but for sure this was really a scary experience. I will cheer for Andrea tomorow in the woman race before heading back to France to do some medicals check up. I hope everything will be ok and the Doctors will just tell me "You pushed a bit to hard that time." End of the season but confident.